Joe Gibbs Racing scheduled a pair of news conferences Wednesday in which Edwards is expected to announce he will not drive the No. 19 Toyota next season. 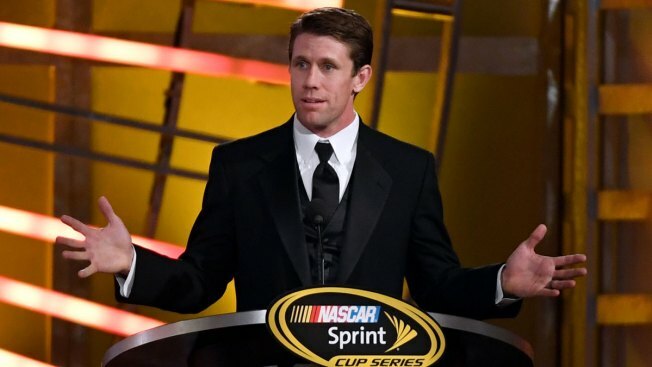 NASCAR Sprint Cup Series driver Carl Edwards speaks during the 2016 NASCAR Sprint Cup Series Awards show at Wynn Las Vegas on December 2, 2016 in Las Vegas, Nevada. In a stunning decision, NASCAR driver Carl Edwards is walking away from the final year of his contract with Joe Gibbs Racing less than two months after nearly winning his first Cup championship, two people with knowledge of the situation told The Associated Press on Tuesday. The 37-year-old Edwards informed team owner Joe Gibbs right before Christmas that he no longer wanted to compete, the people told AP, confirming a decision first reported by Fox Sports. "This is comparable to Barry Sanders' retirement back in 1999, shocking and with loads of ability and time left in a very successful career," said Texas Motor Speedway President Eddie Gossage. Edwards was a four-time winner at Texas in the Cup Series. "I talked to Carl about a month ago and he didn't give any indication that he was considering this," Gossage said. "It is a shock that just doesn't seem real." Also, concerns about Dale Earnhardt Jr.'s concussion history, plus underperformance by Kasey Kahne, could open seats in the future at Hendrick Motorsports. Edwards, who is married to a doctor who specializes in neurological rehabilitation, could also be spooked by Earnhardt's concussion problems. Edwards has given no indication what he's thinking or what the future may hold. In a text message to The Associated Press, he wrote: "I'm kinda hungry. Going to Subway!" in reference to his longtime sponsor. He also stated simply: "All good." Neither Fox Sports or NBC Sports have roles planned for Edwards in 2017, although he has done analyst work on a semi-regular basis the last several years. Edwards came oh-so-close to winning his first Cup championship in November's season finale. He was leading all championship contenders with 10 laps remaining at Homestead-Miami Speedway until a caution set up a restart that bunched the field. Edwards tried to block Joey Logano's attempt to take the lead, and it caused a crash that ended Edwards' title bid. The class and dignity in which Edwards showed after the accident — he walked from his wrecked car to the pit box for Logano and wished that team luck in the closing laps — was widely lauded. He also came close to a title in 2011, finishing second to Stewart in a tiebreaker. Edwards, who is extremely private, has two young children that he steadfastly refuses to discuss in interviews. He lives in his home state of Missouri, while most of NASCAR's drivers live in North Carolina. Edwards won three races in 2016 as JGR dominated the regular season and put two drivers in the final four. He spent 13 years in the Cup Series and has 28 career victories in 445 starts. Suarez, from Mexico, became the first foreign-born driver to win a NASCAR national series when he earned the Xfinity title last season. He will join Kyle Larson as the only two drivers from NASCAR's diversity program to race at the top level.